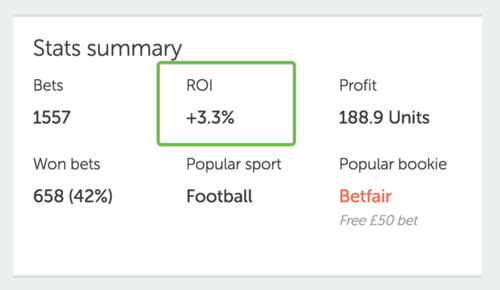 There are many ways to measure the success of your betting portfolio and the ROI (return on investment) is one of them. In many ways it’s the most suitable way both for comparing your progress over time and comparing with other bettors or services. The reason for that is that it is independent from what unit you measure your bets in or how big your starting budget is. It’s simply a way of telling how much you will get in return, no matter if you stake one dollar, a hundred units or ten thousand euros. ROI is usually expressed as a percentage, so in this case you would say you have an ROI of 5%. At Bettin.gs we use all your data and calculate your total ROI based on all the bets you’ve ever registered. This is what you see in the summary on the bets page for example. 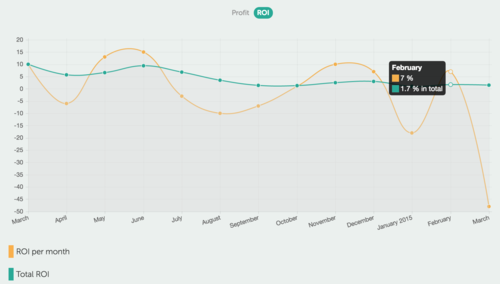 We also calculate ROI over time, like per month or week. The graphs you see on the stats page includes both the ROI per day or month (the yellow line) and the accumulated ROI (the green line). Always keep a bigger eye on the green line, because that’s what matters most in the end use the yellow line to identify positive or negative trends.